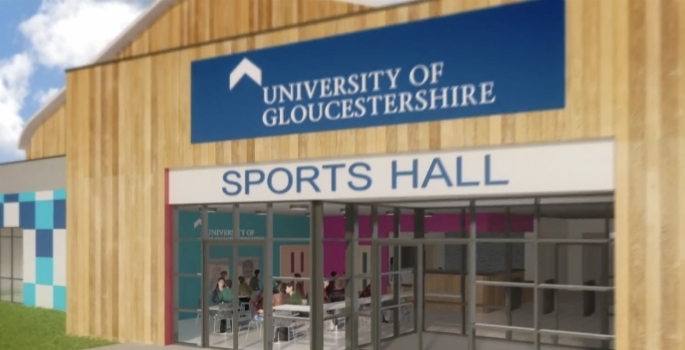 The University of Gloucestershire has released a new video that illustrates plans to create a vast sports hub at its Oxstalls campus in Gloucester. The fly-through video combines drone footage with CGI images which allow the viewer to get a real sense of the scale of the development which includes two new all-weather pitches, a new cricket pavilion and a sports hall across an extensive area from the existing Oxstalls campus and across Plock Court. The development is supported by a range of national and local sports bodies and, working in partnership with the Aspire Sports and Cultural Trust, it will enable more local clubs, teams and the local community to benefit from a higher standard of sporting and recreational facilities. The detailed plans for the new facilities were approved by Gloucester City Council in November 2016 and are expected to be completed during 2018. Dr Anita Navin, Head of School for Sport and Exercise at the University of Gloucestershire, said: “Gloucestershire is a phenomenal county for sporting talent and the university is passionate about enhancing the opportunities for both students and local community.